We Mean Business > d i v e r s i t y w o m a n . c o m Fa l l 2 0 1 7 D I V E R S I T Y W O M A N 39 Most millennials see these issues as facts of life, while other generations don't. For millennials, inclusion was part of their world. It's not just a good idea; it's a fact that including diverse voices makes a bet- ter team. Data back this up. A 2016 study by the Institute for Public Relations found that 47 percent of millennials prioritized D&I in a job search, 14 percentage points higher than gen Xers. e study noted that gen Y was more comfortable discussing D&I issues at work than their older col- leagues. A separate Deloitte study, "e Deloitte Millennial Study 2017," found that millennials, by and large, prefer busi- ness and political leaders who provide "opinions with passion" and who seek to "appeal to anyone who might feel 'left out' or isolated." When it comes to gender equality in the C-suite, millennials are more optimistic than other generations about achieving parity. In fact, 84 percent of millennials believe we could see gender equality by 2030, compared with 66 percent of baby boomers and 74 percent of Gen Xers. Liotta urges other leaders to learn from millennials to accept inclusion as com- mon sense—and good business sense. One of Liotta's clients is a large, global company that was grappling with how to make paid parental leave available, to be inclusive to more employees. "One mil- lennial spoke up and decided to have con- versations with senior leaders right at the very top, even when people advised her that it could hinder her progress in the company," Liotta says. e millennial em- ployee used data and research to back up the case for making paid parental leave ubiquitous at the company—by measur- ing her company's parental leave against that of other global organizations. "e employee began to build the framework and partnership to bring this up and challenge the status quo, but not in a disrespectful way," Liotta says. "She related to people with influence but didn't burn down the house in disrupting the way things were done. Eventually, she was able to have a huge influence within the company and bring about the benefit to all employees. More millennials are learning how to diligently and responsi- bly change things in their organizations without burning bridges." 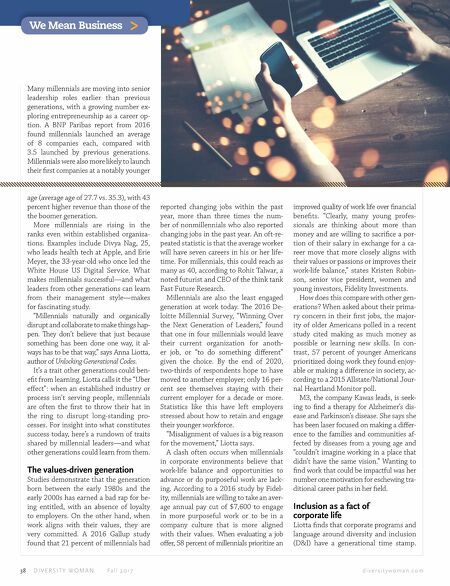 Speaking up and disagreeing As the aforementioned story exemplifies, millennials operate best in organizations without traditional, hierarchical struc- tures. As a result, many have no qualms about sharing their thoughts—even dis- agreeing with authority to do so. "Millennials have always been encour- aged to speak up and stand up for what they believe in—that's what parents, teachers, coaches told them to do," says Liotta. "ey learn the value of having the confidence to speak up from a young age, so of course they don't agree when gen Xers and boomers think that they should wait their turn!" is can result in fiery clashes between generations. Liotta recommends using these as a learning opportunity. Leaders from other generations should be more "explicit, not implicit, about expectations and ideals." Meredith Moore Crosby, executive vice president and chief information of- ficer at Leverette, Weekes & Company, laughs at the stereotype of outspoken millennials. "Yes, I'm loud, but I'm also strategic about who to talk to," she says. "I learn who the decision makers are and how to make the case for what I need." Crosby's impressive résumé includes be- ing the youngest director at McDonald's Corporation and holding director-level roles at 3M and Comcast. The 35-year-old cites an example of speaking up while working with a man- ager from the boomer generation, in a previous role at a large corporation. 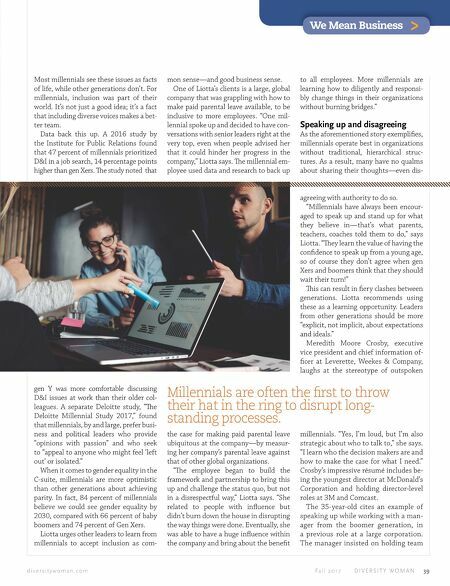 The manager insisted on holding team Millennials are often the first to throw their hat in the ring to disrupt long- standing processes.